Every hunter dreams about shooting the flyways. Now you can, with Benelli's Super Black Eagle II Flyway Limited Edition. Every hunter dreams about shooting the flyways. Now you can, with Benelli's Super Black Eagle II Flyway Limited Editon. 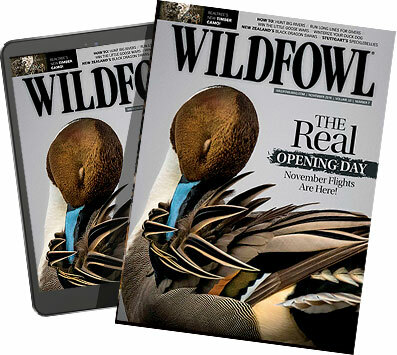 Only 175 of each Flyway edition will be crafted. Each shotgun will be engraved with exquisite wildlife scenes specific to each flyway: Atlantic Flyway featuring Canada geese and canvasbacks, Mississippi Flyway featuring wood ducks and mallards, Central Flway featuring green-winged teal and snow geese and Pacific Flyway featuring wigeon and pintails. The buttstock and fore-end has a satin-finished select walnut that complements the treatment of the metal work. Contact: Benelli USA, Dept. WF, 17603 Indian Head Highway, Accokeek, MD 20607; (301) 283-6981; www.benelliusa.com.